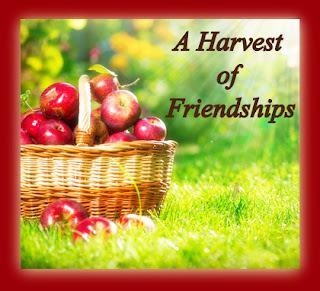 To officially wrap up these extensive postings on friendship I've sweetly titled A Harvest of Friendships, I bring you a videoed message from one of my Golden Delicious Apple Friends and myself. Monday I had the privilege of speaking to my own MOPS gals about our different types of friendships - Red, Green, and Golden Delicious - and the efforts we can take to polish them all up nicely. At the end of the message they had lots of questions and concerns. One of the most common concerns I heard voiced was simply the trouble with friendships. And indeed, friendships take work, require boundaries, and call for courage. But ladies, they're worth it. So without further ado, a word from me and one of my beloved Golden Delicious Apple friends, Kim. Have you begun a new friendship recently? I'd love to hear how you went out on a limb to make a new friend!